To open the individual student and teachers to the possibility of being more fully in touch with their own faith life. Enable students to take their religious understanding to new levels, not just of study, but of commitment and responsibility. Call all students to respond to God with love and appreciation through experiences such as prayer and worship. Prepare young people to live in community and to participate actively in their life and mission of the church. Prepare students to live as followers of Jesus in their professional lives. Encourage students to question the world around them. Strengthen the faith of the student in their understanding of the Catholic tradition. Enable students to tell their story of her faith community. Stimulate open, inclusive attitudes among students of different social, ethnic and religious backgrounds. Deepen the students’ knowledge of faith, providing an opportunity for them to explain their faith to others. Holy Family Youth is a faith based group which dates back to 1820 in Bordeaux, France. 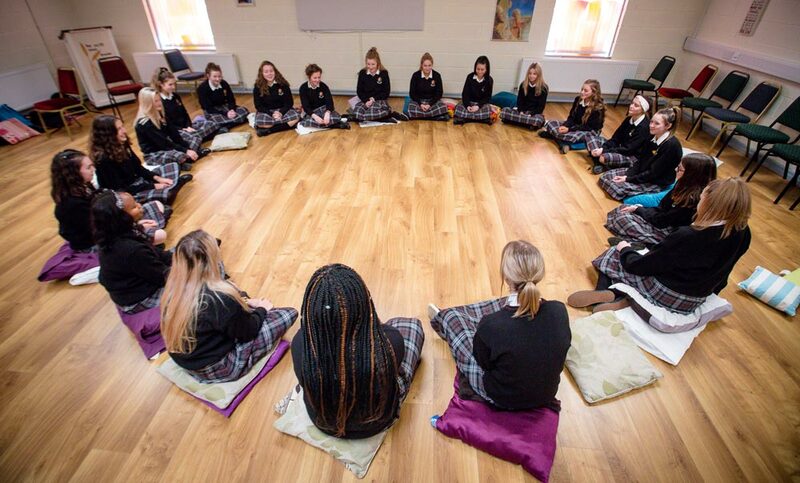 Today in our school, Holy Family Youth (HFY) are an energetic group of 5th and 6th year pupils who dedicate themselves to living out their Catholic / Christian faith within the school community, at home and in their local parish. The motto of Holy Family Youth is “Live my faith through positive action. Spread the good news of Jesus. Be family and build family.” HFY work directly with 1st and 2nd years in the school. They plan and lead special programmes of welcome and support for 1st and 2nd year students at the beginning and at different stages throughout the year. They introduce the first years to school life; helping them with the timetables, lockers and layout of the school, and they are a constant source of help for First and Second year students. HFY members also play an important role in leading part of the first year Reflection Day. The Pope John Paul II Award enables students to take an active part in the life of their Church and their community. It enables Holy Family students to become more aware of the teaching and role of the Catholic Church in the world and to engage at a deep level with Christ. Pope John Paul II leaders make every effort to entice students to connect with their local parish. The chaplaincy team assist students in the realisation that they have a special role to play within the parish community. Each year, Transition Year students are invited to participate in the award and they spend the next twelve months dividing their time in volunteering in their local parish church and community. Students have the option of completing either the Bronze, Silver or Gold Award. When Holy Family Students complete their Gold Award, they can progress to complete the Papal Cross Award, which involves 26 hours of both Parish involvement and Social Awareness. Faith Friends prepares 6th class students for their Confirmation in a positive and lively way, within a safe and caring environment. It involves ourTransition Year students who are participating in their Pope John Paul II Awards. Faith friends enables our Transition Year students to become a leader for confirmation students. It supports both Holy Family students and primary school children to share their knowledge, wisdom and experiences of being part of the Church. It is a learning and growing experience of both the children making confirmation and those who are seen to be helping them on this journey of faith.